'Kuddum Russool at Gour, where they show the print of their prophets foot in a piece of while marble'. bl.uk > Online Gallery Home	> Online exhibitions	> Asia, Pacific and Africa Collections	> 'Kuddum Russool at Gour, where they show the print of their prophets foot in a piece of while marble'. 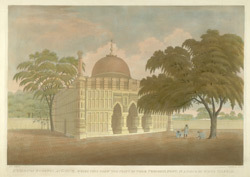 Coloured aquatint with etching of the Qadam Rasul Mosque at Gaur, from 'Views at Gaur', six aquatints by James Moffat after Henry Creighton, published by Moffat in Calcutta 1808. Gaur has the remnants of many monuments. Part of the 15th century fort remains along with its much ruined gateways or 'darwazaha'. The Qadam Rasul Mosque was built by Sultan Nusrat Shah (1519-32) in 1531 and, according to legend, contains a representation of the Prophet's footprints on a small pedestal in black stone. The building consists of a square hall flanked by a verandah on three sides. On the eastern side the verandah has three arched openings resting on short octagonal piers. At the exterior corners there are octagonal towers decorated with stylized motifs and capped by pinnacles. The verandah is covered by barrell vaults while the central hall is domed. The exterior decoration consists of a row of recessed panels.